A couple of utterances of prominent American public figures recently have reminded us of why the country voted for a complete change in 2016. President George W. Bush, speaking in Dubai, violated the custom, until now scrupulously upheld, of a former president not criticizing the incumbent in remarks given in a foreign country. Generally, ex-presidents observe a decorous silence about their successors, even when speaking within the United States, but it has always been considered unseemly and an indignity to the great office for a former holder of it to criticize, while abroad, the incumbent. We were reminded of George W. Bush's gaucheries, of how he pronounced Iraq "eye-rack," and of his malapropisms: "This sucker could go down" (in the financial crisis of 2008); "Brownie, you're doing a heckuva job," to the emergency-relief director in New Orleans after Hurricane Katrina, while the police deserted, looters ruled whole neighborhoods, and chaos reigned; and "Yo, Blair," as he greeted the British prime minister at a G-7 meeting when his mouth was full of food. There have been some embarrassments with President Trump: invented words, very odd tweets, and outbursts of ego. But in general, his syntax is correct, and when he cites some phrase or truism, it comes out right. Not for Mr. Trump such jangling tautologies as "We've got them on the run, and . . . they're running." The burden of Mr. Bush's reflections in Dubai was that the United States should leave its southern border open because Americans won't bale cotton when it's 105 degrees. Every complacent cliché about immigration tumbled inelegantly out in one dumb sentence. Cotton harvesting has been automated for 50 years, and not more than a fifth of illegal migrants are now drawn to agriculture. There is also something fundamentally irritating about hearing jibes at Mr. Bush's latest successor from the Gulf States (where the Bushes have allegedly flourished personally), from the man who committed the United States and many allies to the Iraq War, which then fragmented in a human tragedy and ended up with Iran being the leading influence in Iraq. It was all undertaken in the name of democracy, a crusade that elevated the anti-democratic Hezbollah in Lebanon, Hamas in Gaza, and the Muslim Brotherhood in Egypt; in Iraq, the Islamic State eventually arose (no direct fault of Mr. Bush). What could this warrior for democracy, who announced "mission accomplished" with great triumphalism on the American aircraft carrier USS Abraham Lincoln in 2003, have been thinking in extolling the virtues of illegal migration, to do menial work in inhuman conditions in the U.S. Southwest, to people in the Emirates? In this merciless tyranny of American political correctness, such reflections, if made by Donald Trump, would get a hundred Democratic House votes for impeachment. Now, for the frenzied and frightened American Left, the danger is so great that their former bête noire, George W., whose verbal limitations had them splitting their sides with laughter for ten years, now merely brings a nostalgic sigh for the times of so ineffectual and unthreatening an adversary of the inexorable bipartisan march of the liberal elites. As was often the case with Mr. Bush when he was president, his remarks in Dubai were unpresidential — an allegation much bandied about against the present president over the past year. In fact, it is a myth even that President Trump is inarticulate. His speech is actually more adroit, fluent, and grammatical than were many of the extempore remarks and answers to press questions of Presidents Truman, Eisenhower, Johnson, Ford, Carter, and both Bushes. Mr. Trump is slightly less articulate than Presidents Clinton and Obama, who never said anything memorable but made their points smoothly. Mr. Trump is not as thoughtful a speaker or public conversationalist as John F. Kennedy or Richard Nixon, and not a great orator like Franklin D. Roosevelt or Ronald Reagan. But he handles press questions better than Reagan did, and delivers extempore addresses better and more animatedly and effectively than Mr. Obama did. Mr. Trump's improvised addresses to large crowds of fierce partisans in the heartland of America are effective and always entertaining. But the Washington press corps professed to believe him incapable even of reading a speech off a teleprompter, until after he had sewn up the Republican nomination. His address on foreign policy on April 27, 2016, was the first such teleprompter speech. These speeches are now commonplace, and he speaks with authority, holding the podium and looming over it, a large and confident man who enunciates clearly (unlike some of his predecessors), is never flustered, rarely syncopated, and only occasionally repetitive. The emerging fact, which will take a long time to be admitted because it is so unpalatable, is that he looks, and largely sounds, like a president. Justice Ginsburg had threatened to leave the country if Mr. Trump were elected, an inappropriate public reflection for someone in her position, and at Columbia she took it upon herself to blame a "macho" public attitude for the defeat of Hillary Clinton. This was completely gratuitous opining from a source who is required to avoid deliberate agitation of partisan sentiments. And it is false: The majority of white women voted for Trump, and not because men threatened to chain them to their kitchen sinks if they dared vote for the first major-party female presidential candidate. Justice Ginsburg's intervention was gratuitous, provocative, and factually inaccurate. That is not what Supreme Court justices do for a living, and the chief justice should rebuke her. Having passed tax reform for the first time in 30 years, and now tackling both immigration, a problem that had been allowed to fester rampantly for 50 years, and reconstruction of the decayed infrastructure of America, Donald Trump is slowly climbing in the polls. 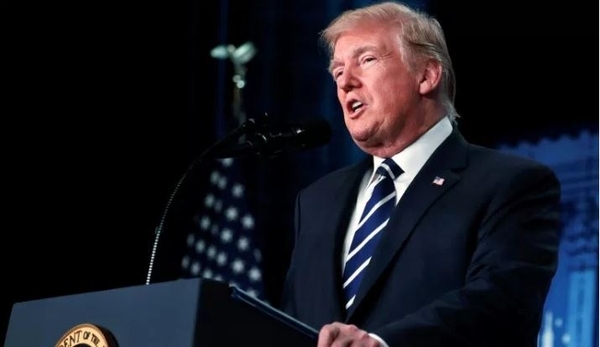 He is steadily more widely perceived as a president who identified the country's problems that the political class had ignored for years, campaigned to address them, and is carrying out his promises. A year ago, the Republican congressional leaders were waiting to see whether Mr. Trump would be impeached, while their Democratic colleagues worked like beavers to achieve that goal. Six months ago, the Republican congressional delegations had joined forces with the president, but the Democrats were still in scorched-earth guerrilla war. Now, even Chuck Schumer acts as if he understands that Mr. Trump is the president and not just a freakish placeman whose presence in the White House causes the Statue of Liberty to burst into tears like a rural Irish Madonna (a recurring fantasy for that senator). Even the briefest glimpse of personifications of the complacency and incompetence that Trump displaced should make the heart beat faster. The incumbent is not without his limitations, but a few words from George W. and Justice Ginsburg remind us that the thought of almost any combination of current Bushes, Clintons, and Obamas having another crack at it is both nightmarish and sobering.